LONDON — Scottish singer Susan Boyle is emblematic of the out-of-the-ordinary talents that turn up on Britain’s Got Talent, a show that features dancers, comedy, and sideshow acts along with vocalists. LD Dave Davey, set designer Dominic Tolfts and Simon Deary of LED Poison sought to mirror the variety of the acts themselves with visual versatility, and they relied on substantial quantities of ColorWeb and ChromaStrip LED products from HSL to do it. Simon Stuart and Sean McGlone were the project managers for HSL. With a combination of low, medium and high resolution LED surfaces, the creative team provided at least 50 different performance looks for the 10 finalists as they battled it out throughout the week-long series. 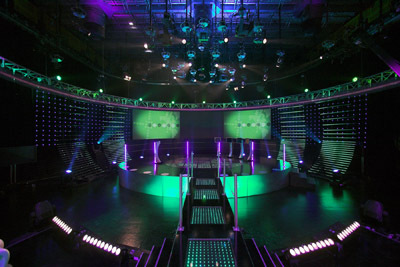 Additional looks were needed from the same set for guest spots, and a series of generic default states was also required, including incorporation of the series’ logo and branding. HSL supplied nearly 600 Pulsar Chromastrips, which were integrated into four large and one smaller metal fins running down each side of stage, and also used to highlight the two sets of staircases and the edges of the judges’ rostra. The 480 panels of ColorWeb 250 and 50 panels of ColorWeb 125 mm pitch were used to wrap around the entire back wall of the set, alleviating the black holes and creating background movement, color and interest. Programmers Russell Grubiak and Bill Peachment used four Hippotizer media servers run via a CompuLite Vector Blue lighting console and a CompuLite Vector Green and Hippo Critter to control the video images, which included custom content for each of the finalists created by Jane Aspinwall of Timeslice films.